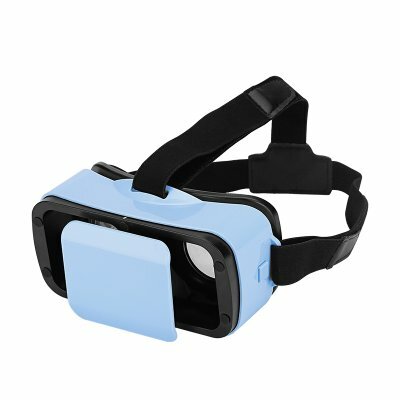 Successfully Added Stylish VR 3D Glasses - Adjustable T-Shaped Head Strap, Pupillary Distance, Focal Depth, Lightweight (Blue) to your Shopping Cart. VR is all the Rage but not everyone can afford to drop a thousand dollars to experience this amazing new technology, well don't worry as you can experience the virtual world for less than $10 with this fantastic VR headset. Suitable for Smartphones measuring from 4.7 to 6 inches this VR headset can be used with the majority of Android and iOS devices. It comes has a full adjustable T-shaped head strap to ensure a snug fit and thanks to a lightweight deign coupled with soft padding make it comfortable to wear for long periods. So its great for viewing 3D films. To ensure great viewing for all the pupillary distance can be adjusted from between 60 to 70 mm and the focal depth moves though 18 mm so even those without perfect sight can enjoy 3D viewing with these fantastic VR glasses. A great entertainment and educational tool letting you explore new worlds form the comfort of your living room these VR glasses are a great way to dip your toe into the world of VR, so go on take the plunge. These 3D VR Glasses come with a 12 months warranty, brought to you by the leader in electronic devices as well as wholesale VR headsets..